GIS Center Director Chad Sperry traveled to Taylorville, IL Sunday morning to help with the damage assessment after a tornado passed through the center of town Saturday afternoon. Sperry returned to Taylorville Monday morning with two WIU students to help map the damage caused by Saturday's tornado. 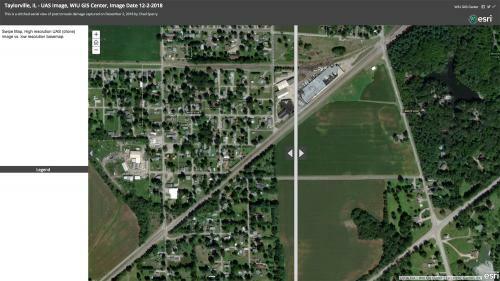 The above photo is an example of what the maps will look like. 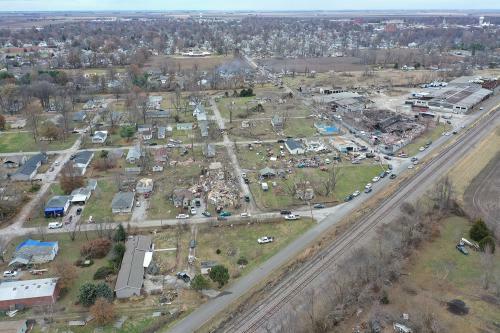 Tornadoes cut a path across numerous Illinois counties, including McDonough County, where WIU is located, and in the Christian County, community of Taylorville, southeast of Springfield, where 100 homes were damaged in the community of nearly 11,000 people. WIU's assistance with the response began early Sunday morning, when Christian County emergency responders contacted WIU Geographic Information Systems (GIS) Center Director Chad Sperry about helping with the effort. Sperry took the University's drone to Taylorville to get an immediate overview of the damage. "They were asking for drone support for damage assessment - using a drone is relatively new in the damage assessment field – we use them to capture, in real time, post-event conditions," said Sperry. "Taylorville had probably the most significant damage in Illinois Saturday; the tornado passed through the middle of town. They told us the tornado seemed to bounce, hitting one home and then jumping up, then down again." Emergency responders went door-to-door Sunday to determine the damage to each Taylorville home. Monday morning, Sperry headed back to Taylorville with WIU student Adam Fackler, a senior law enforcement and justice administration (LEJA) major and GIS minor, and Edgar Rodriguez, a senior emergency management student, who is also McDonough County's Emergency Services Disaster Agency (ESDA) director. The trio was making the return trip to help create an information map that outlines the path of the damage. "We will work with the information they collected to create a map showing what areas were impacted," said Sperry. Fackler said going along to help with a real disaster response is "a great emergency management experience as a student." "It's one thing to make plans and run exercises for these disasters, but being able to respond to a real disaster puts everything I learned in the classroom into perspective," he said. Rodriguez said he believes his WIU education has prepared him to not only take over as McDonough County's ESDA director but also to help with regional events such as the one in Taylorville. "Western has the only emergency management program in the state of Illinois, and the program's alumni are well represented in key positions in the state and the nation," said Rodriguez. "It is always great to meet fellow WIU alumni in Emergency Management events and conferences." Media reports of the Taylorville tornado indicate that the community's residents had 41 minutes of advanced warning, which is believed to have minimized injuries. The National Weather Service was able to alert the community to take cover, which is believed to have saved lives. WIU is in the process of purchasing a new radar, which will be installed on top of Memorial Hall by April 2019. The addition will allow the public and first responders to access the radar images and will allow for more accurate readings. The WIU Department of Earth, Atmospheric and Geographic Information Sciences is currently raising money to pay for the radar's ongoing maintenance. Donations are being accepted at bit.ly/FundWIUDoppler. For more information about WIU's GIS Center, visit wiu.edu/gis.